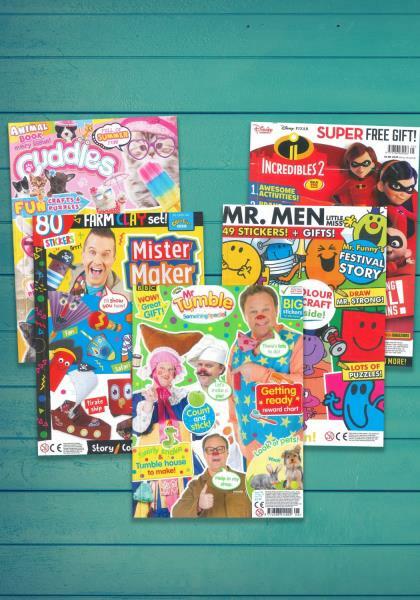 Find Something Special, Mister Maker, Disney Stars, Mr Men Little Miss, and Cuddles in this package. Please note, we can tailor bespoke packages where you can personally choose from a selection of over 3,000 magazines! Buy this primary school magazine package or browse our other packages. Something Special is aimed at children with special needs, covering information about disorders, learning, lifestyle and different age groups. The publication is designed to help readers and their families to communicate with the assistance of Makaton signs and symbol. It is an educational, entertaining and great value package offering exciting, unique gifts, bright stickers, stories, posters, matching, counting, spotting, colours and lots more tumble fun. Mister Maker magazine encourages young people to showcase their creative side with minute makes, special projects and lots of art tips! Kids will love to get artistic with their hero, Mister Maker, and his friends – The Shapes, Scrappz and Tocky. Each issue includes a make pack designed to bring fun from the screen directly to the reader! Disney Stars is THE magazine for diehard Disney fans; it is the perfect companion for the obsession of Disney featuring entertaining activities, stories, puzzles, colouring pages, stickers and posters. Each issue follows a different theme from the newest and biggest Disney brands. Mr Men Little Miss reinforces learning from the Early Years Curriculum focussing on communication, language and literacy in a fun, interesting way, helping children acquire numeracy and literacy skills. It is bright, bold and fun filled with puzzles, colouring, crafts, stickers and gifts. Cuddles is purr-fect for children who love cute and cuddly animals. Each issue provides children with endless fun featuring animal adventures, paw-some puzzles, animal facts, activity books, stories about adorable animals of all shapes and sizes and so much more.